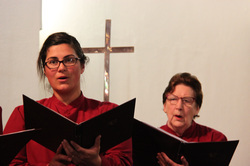 The Singers became incorporated in 2005 as The Cathedral Singers and continue to take part in liturgies at parishes of various denominations around Sydney, and occasionally perform in concerts. The choir has visited parishes in NSW, interstate and overseas and will remain active in this part of its mission. Performing a wide range of repertoire from the 16th to 21st Centuries, the Singers provide busy people with the opportunity to sing cathedral music without the commitment of regular weekly services. We are pleased to announce that Sir Trevor Garland has accepted our invitation to be Patron of The Cathedral Singers. Further details in our June newsletter in the News page. The choir rehearses every Wednesday evening from 7:30 pm to 9:30 pm at St. John's Anglican Church, Gordon, Sydney. TCS celebrated their 25th Anniversary with a Choral Evensong at St John's, Gordon in October 2015 followed by a party. Pictured are three of the four DIrectors cutting the celebratory cake. Interested choristers are invited to contact the Chair of the Committee or Director.